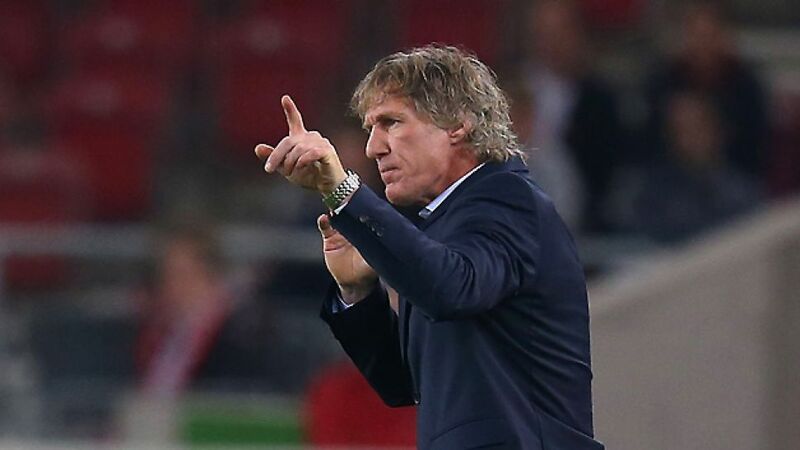 Can Verbeek turn Nürnberg's fortunes around? Nürnberg - Upon his unveiling as new 1. FC Nürnberg coach, Gertjan Verbeek claimed he had "fallen in love" with the Franconian club. The question is, will Nürnberg's fans have grown to love the 51-year-old Dutchman come the end of the 2013/14 season? Verbeek, who has forged a reputation as an astute tactician during his time in Holland's Eredivisie with SC Heerenveen, Feyenoord, Heracles Almelo and AZ Alkmaar, speaks fluent German, but is relatively unknown outside his home country. The 51-year-old got off to a solid enough start: a 1-1 draw at VfB Stuttgart is unlikely to have wowed supporters, but there was enough on show in Matchday 10's opening fixture to suggest Verbeek can guide der Club out of trouble. Though they were put under pressure by Stuttgart for long periods of the second half, the visitors remained disciplined and left the Mercedes-Benz Arena worthy of their point. One thing that will have pleased the Dutchman and the fans was the Bavarian club's response to going a goal down early in the match. When Niklas Stark pulled down Alexandru Maxim in only the third minute, allowing Vedad Ibisevic to tuck away his seventh goal of the season from the penalty spot, Nürnberg's visiting fans might have feared the worst. Yet they recovered: Josip Drmic equalised three minutes after the opener. After the game in Stuttgart, Nürnberg keeper Raphael Schäfer described Verbeek as a "strict disciplinarian with a calm character." A combination of those two attributes may be exactly what the Bavarian club need at present. With confidence understandably low following their start to the campaign, the last thing the Franconians need is their new coach to start making knee-jerk reactions to their current predicament. A firm, but fair approach is needed - anything else may well be counter-productive. With the right approach, Nürnberg could soon find themselves climbing the table. Seven draws from ten matches already suggest they are difficult to beat, but the longer they continue without winning, the more difficult they will find it to collect those elusive first three points. Nürnberg's next fixture just so happens to be against fellow strugglers SC Freiburg at the Grundig Stadion. After expressing their disappointment at failing to win in Stuttgart, the players will be desperate to record their first win of the season against their direct rivals near the foot of the league table. The Freiburg game becomes even more vital when Nürnberg's next three fixtures are taking into consideration: after Matchday 11, Verbeek's side travel to Borussia Mönchengladbach, who are yet to lose at home, before hosting VfL Wolfsburg. They then face a trip to the BayArena to take on third-place Bayer 04 Leverkusen. If Verbeek can pick up points from those games, Nürnberg's fans might just begin to warm to their new coach.